This worksheet is used to record pressure and flow readings at air pipe manifolds and meter panels. It will help to identify problems in the air pipe and indicate the highest flowing cables on each air pipe run. When reading flows on a distribution panel in the central office, a separate worksheet can be used for each panel. This will enable you to make future comparisons of flow changes. Another option would be to record all distribution panel flows on the same worksheet. This would make it easy to prioritize the highest flowing panels. With either method, you should always set priorities to repair the highest flowing, most damaging leak first. 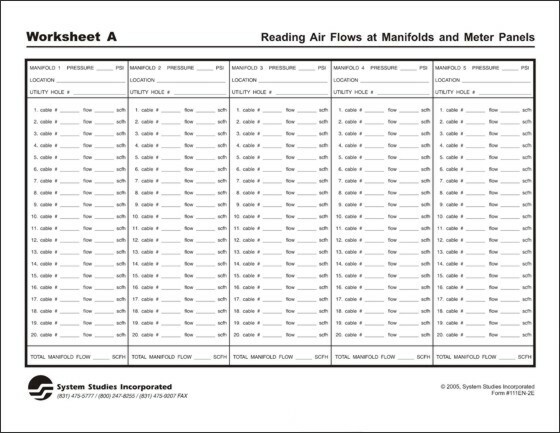 In a pipe system Worksheet A is used to set leak locating priorities as well as to identify potential pipe problems. Once the flows at all manifolds on an air pipe have been recorded and totaled, they should be compared with the total flow at the pipe alarm panel. If the sum of the manifold flows is not within 70 percent of the total pipe flow, the air pipe should be purified to locate such potential hazards as pipe leaks, buffer hoses not removed after splicing (commonly referred to as "cheater" hoses), unrecorded manifolds ("ghost" manifolds), or mislabeled and transposed air pipes.